Price: £2.99 (incl VAT) Sorry, this product is no longer available. 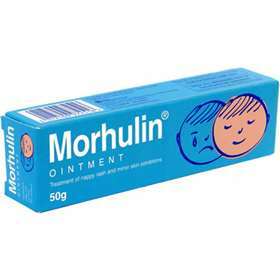 Morhulin Nappy Care Cream is for the treatment of nappy rash and minor skin conditions. It contains cod-liver oil and zinc oxide, which help to remove dead skin cells from wounds and promote healing. Morhulin Nappy Care Cream is oil based and contains no water, allowing the skin to retain moisture more effectively. Please note that the image depicts old style packaging. The forumla has now been updated and is a cream not an ointment. Product code: MOR4M Price: £2.99 (incl VAT) Sorry, this product is no longer available.